This week we're showcasing new Account Manager, Rebecca Zoz. Rebecca lives in Lincoln with her three kids: Mackenzie, Logan, and Andrew. Favorite things to do on her days off: Anything with my kids! When they are not with me, I enjoy reading, swimming, walking my dogs and catching up with friends. Favorite place to travel: I would have to say Lake Okoboji. It’s been a tradition in my family for over 60 years. We go every summer and occasionally jet up for a long weekend. Everything is better at the lake! Favorite time of the year: Summer. The older I get, the less I like winter. I am not bothered by hot, humid weather, in fact the hotter the better. Most weekends my kids and I can be found in our above ground pool. 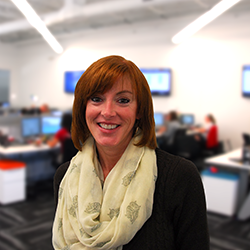 What made her want to work at Mortech: The low employee turnover combined with cutting edge technology and superior customer service. Last time we showcased General Manager Doug Foral, which you can read here. Or to learn more about Marksman, you can click here.